As I sit here typing away in the early morning hours (frittering my life away somewhere in-between the lost and the lonely) it is dark, cold and foggy on the other side of my bedroom window. Plainly-speaking, one simply could not ask for a better environment than this when it comes to streaming the ominous music of Torturerama for the first time! Formed in 2008 and made up of members who have spent time with the likes of Solipsist, Viggen, Predatoria, Ex-Inferis, Death Penalty, Culpable Homicide, Body of Christ, Mothra and Gorath, Torturerama are a dark and foreboding modern day death metal band obsessed with the past. Or to narrow it down some (and bearing in mind that this might only pertain to this four-track release and not the band's 2010 debut, the EP "Left as Remains") the Stockholm death metal scene of the nineties! And seeing as the Stockholm death metal scene of the nineties delivered killer material from the likes of , Grave, Carnage/Dismember and Unleashed (with the first three groups in particular (or rather Entombed, Dismember and Grave) serving as inspiration for this rock-solid EP!) it's all good as gold when it comes to this Belgian death metal band! 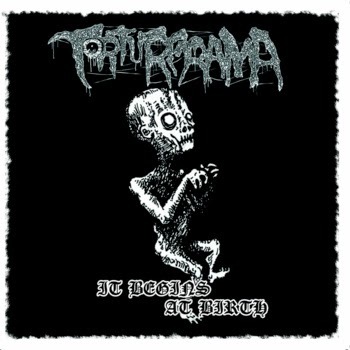 While Torturerama's "It Begins At Birth" (which was originally released as a limited-edition cassette) isn't necessarily breaking new ground that does not mean it should be overlooked either. No, they are not a carbon-cony of the original source of inspiration, but still Entombed fans in particular (especially those who love the material of the early years) would do well to sit up and pay attention to this EP as it strikes all the same cords and will move through you in much the same way as the Swedish band used to. If you count yourself a member of that club then every minute that passes of this second EP from Torturerama will break your heart in all the right ways. At it's best "It Begins At Birth" is a spiritual successor of Stockholm scene. At it's worst it's still heads and shoulders above a lot of what passes for modern death metal these days. So really there is not much of a risk factor at all when it comes to this Belgian death metal band's latest is there?